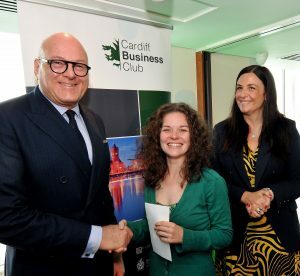 Young entrepreneur Sarah McHarg has received a special award and bursary from the Cardiff Business Club for her enterprise, Massages for Pirates. Sarah, 28, established her business in 2017 with support from youth charity The Prince’s Trust Cymru. After losing her job and suffering a series of illnesses, Sarah wanted to explore self-employment but didn’t know where to start. The Trust’s Enterprise programme gave her the confidence, guidance and support she needed to make it on her own. Sarah’s business, Massages for Pirates, provides a holistic therapy service inspired by buccaneers and the seven seas. Alongside the traditional benefits of physical therapy, Sarah promises ‘banterous conversation’ and treatment at a reasonable cost, hoping to dispel the myth that therapy is unaffordable for the majority. To be nominated for the award, the business was required to demonstrate sustainability and have an element of community or social benefit. The Prince’s Trust Cymru is undergoing a period of change to increase its provision for young people. The charity wants young people to be at the heart of economic growth in Wales, and it is urging organisations to work together to achieve this collective ambition. The Prince’s Trust Cymru has recruited senior figures from across different sectors to support its growth plans. This includes former Permanent Secretary to the Welsh Government Sir Derek Jones, BT Cymru Director Alwen Williams and Director of CBI Wales, Ian Price.